Click on the thumbnail for a closer look. 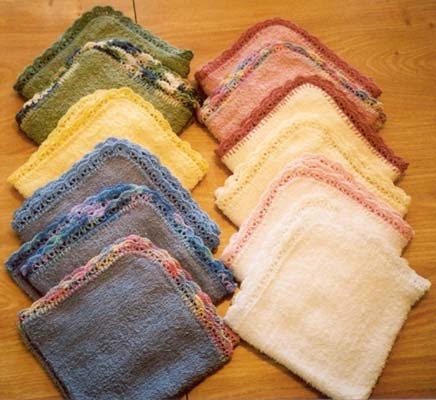 Comments: These are purchased washcloths with a crocheted edging. Colors: (Washcloth/Edging) White/white, white/pink, ivory/ivory, ivory/rose, rose/rose, rose/pink multi, blue/blue, blue/pink multi, blue/blue multi, green/green, green/green multi, yellow/yellow. Size: Approx. 13" including edging. Custom: E-mail with requests for different combinations. These are the colors of washcloths I have, as well as dark green and navy, which I haven't tried yet because they might bleed into the edging. Shipping: $1 for one washcloth, $.50 for each additional washcloth shipped at the same time.